Chesaning.......chances are you have already heard of us. After all, the Saginaw County Fair, Mid-Michigan Old Gas Tractor Show and Christmas Candlelight Walk attract thousands of visitors each year. But it is the other side of Chesaning, the traditional small American town with a charming main street that we want to share with you. 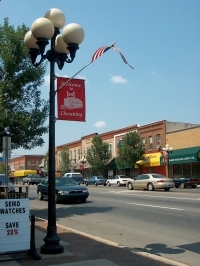 Chesaning offers a unique lifestyle. Nestled as we are in the very heart of mid-Michigan, the cultural attractions and other benefits of the surrounding large cities are easily accessible. But residents do not sacrifice the traditional advantages and strengths of a small town. We think we've got the best of both worlds. Size is one key to our quality of life. But it's not just size that keeps us close. We're a community that knows how to organize and work together and enjoy doing it! Chesaning supports a top-notch school system which reflects the deep pride we feel in our children and our community. Recreational opportunities abound in Chesaning. Located on the picturesque Shiawassee River, the village features several parks including Showboat Park which has, among its many amenities, a campground where both primitive and electrical sites are offered. For the golf enthusiast there's the challenging 18-hole Twin Brooks Golf Course. Tennis, cross-country skiing, canoeing, boating, volleyball, softball and fishing are among the recreational offerings. There is also an outstanding children's playscape in Cole Park. We could go on and on. Instead we offer this website for you to explore. Or call the Chamber of Commerce at 989-845-3055.